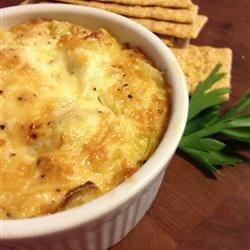 "This amazing Asiago dip is always the hit of the night! It has four ingredients and takes only five minutes to prepare. Make sure you bring the recipe wherever the dip goes! Serve with pumpernickel bread." In a microwave-safe bowl, stir together the Asiago cheese, mayonnaise, artichoke hears and garlic. Heat in the microwave at 50% power for 30 seconds at a time, stirring between heatings until cheese has melted and dip has a smooth consistency. Serve warm. Sorry, but I think one star is a VERY generous rating for this recipe. The mayo totally overpowered any other flavor. Just came home from a party. People raved! I added a little extra garlic. Really easy. Really good. I'll be handing out the recipe at work! Different. The cheese flavor was a bit strong but had several compliments. I may use sour cream instead of mayo next time for a softer flavor. I give this 5 stars with changes. I used only 1/2 c and used Miracle Whip in place of mayo. I also used 4 cloves of garlic. Very easy to make.